Delta Hotels by Marriott Quebec welcomes its guests with contemporary sophistication, thoughtful amenities and a prime downtown location. The modern rooms offer plush bedding, free Wi-Fi, and abundant natural lighting. Start your day off at Le Bistro for a delicious continental breakfast buffet, and hit the fitness center or outdoor pool to get you ready for the day ahead. 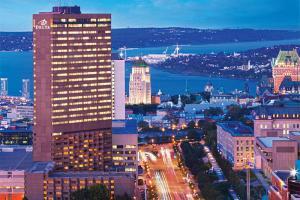 This hotel is a short walk from Quebec City's Old Town district and an array of famous attractions.